Cooking has never been one of my strong suits, but I do have a few tricks I have up my sleeve. One of the best things I can make are waffles! I know this may sound basic, but my friend Sarah gave me this amazing recipe the year I got married and my waffles have never been the same. Prepare batter according to Bisquick box (except with ingredients listed above). Cook in your waffle iron as usual. Serve warm, with your favorite syrup and toppings! The trick is in the club soda. It makes the insides light and fluffy, while ensuring the outside is nice and crispy. It's a fool-proof recipe that yields delicious results! 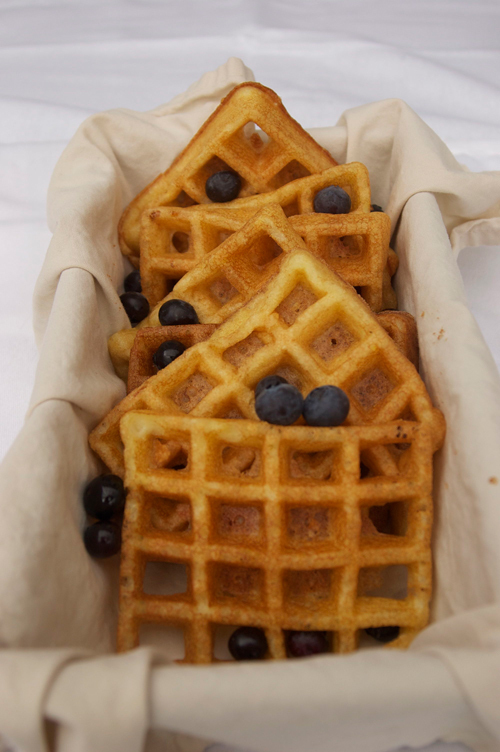 Have you tried club soda waffles? This looks amazing! I'm a huge waffle lover but they are not common at all in Brazil so I haven't had one since I moved here. Sniff sniff. I haven't had them, but I'd like to try! Do you think the club soda plays a similar role to buttermilk? Ana - Bummer! You never realize how much you miss something until you can't get it anywhere. Shilohmae - I do think it aids the consistency of the batter, but the club soda is a lot lighter than buttermilk. The carbonation really helps the waffles to crisp around the edges, while staying super light inside. Let me know how it goes when you try it!